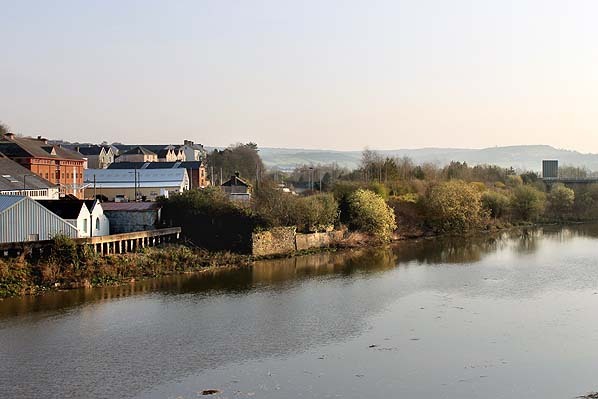 Notes: Carmarthen station is situated south of the River Towy on the south edge of the town. It is located on the West Wales Line and is managed by Arriva Trains Wales, who operate most of the passenger trains serving it. The present station opened on 1 July 1902 although the South Wales Railway's main line from Swansea to Neyland reached it some fifty years earlier. This original station was built with westward expansion in mind (being located at the base of the triangular junction half-a-mile south of the present station) and was poorly sited for the town itself. station building was on the down side, and was, in many respects, typical of those constructed at that time by the GWR. It was single-storey and of brick construction, with stone window hoods and cills. The lengthy building had three hipped slate roof sections, at the north and south ends and in the centre, connected by two ridge-roofed sections. There were tall chimney stacks, removed by the end of the 1980s. A canopy ran the full length of the building on the platform elevation. A smaller building, also with a canopy, was sited on the up platform. The platforms were spanned by a covered footbridge at the north end of the buildings. There was a signal box on the up side 100yd north of the station. There were a number of sidings to the south of the station on the up side; one of these had a turntable at its end. A standard Churchward six-road engine shed with a large workshop opened here on 11 February 1907 replacing an earlier depot at Carmarthen Junction. In BR days it was designated 87G; it closed on 13 April 1964. Trains running north from Carmarthen once served Newcastle Emlyn, Aberayron and Aberystwyth with a connecting line to the Heart of Wales line at Llandeilo. Today, none of the lines to the north survive and, with the removal of the bridge over the River Towy to the north of the station in 1983, Carmarthen is now a terminus at the end of short spur from the main line at which all trains have to reverse before continuing their journeys. This was not so much of a problem with DMUs but led to the need for a run-round of locomotive-hauled trains which were regularly used until the mid 1980s. replacement canopy. There are still good facilities in the station building including the booking office, waiting room, coffee shop, toilets and a BT police office. The down platform building has, however, been demolished and replaced with a bus shelter. The through line has been lifted and local crew rooms built on the infilled bay line. To the east, Arriva Trains Wales operates services to Swansea, Cardiff Central, Manchester Piccadilly and Holyhead. First Great Western currently operates one service to and from Carmarthen to London Paddington. Most of the local train services west of Carmarthen are timed to connect with the London Paddington services at either Swansea or Cardiff Central. To the west, Arriva Trains Wales operate services to Pembroke Dock, Milford Haven and Fishguard Harbour. Carmarthen is the eastern terminus for a few of these services. Some of the Arriva Trains Wales boat trains to and from Fishguard Harbour serve the station. These connect with the Stena Line ferry to Rosslare Europort in Ireland, with a daily morning and evening service in both directions. This route has been in existence since 1906.
crossing over the River Towy at Carmarthen and the excavation of a tunnel between the valleys of Skanda Vale and Dolgran, under the Brechfa Forest south-west of Pencader. The first mile to a terminus at Carmarthen opened on 1 March 1860 after which progress north was rapid, with Conwil station opening on 3 September 1860. At this time, the C & CR owned no rolling stock so they had to rely on the SWR to provide the service. This created tension between the two companies owing to excessive charges being levied and, as a result, the service was suspended on 31 December 1860. The company then hired two 4-4-0 tank engines and reopened the line with its own rolling stock on 15 August 1861. In October 1861 Bronwydd Arms, a new station between Carmarthen and Conwil, first appeared in company timetables. both ventilation shafts. Work was expected to be completed by December 1860/January 1861.
opened with the new line. The next section from Lampeter to Strata Florida was completed by 1 September 1866, and the final section to Aberystwyth by August 1867. Llandyssil, but still four up trains The M & MR timetable of the same date showed three through trains in each direction between Carmarthen and Aberystwyth, with an extra morning service in each direction between Carmarthen and Lampeter. On 1 July 1882 the C & CR was absorbed into the GWR. Saturdays-only train between Lampeter and Pencader, to connect with the morning Newcastle Emlyn to Carmarthen service. The Newcastle Emlyn branch was never busy, but the new 'main line' thrived by serving the local farming and wool industries though, in the years following the First World War, this traffic gradually declined as local bus services were introduced. Between the wars the GWR provided camping coaches at several stations. The route earned a reputation as a meandering rural branch where trains trundled along, often flagged down by market-bound farmers' wives making their way across the fields to board the carriages. In fact, nearly three hours were permitted for the 56-mile journey between Carmarthen and Aberystwyth. December 1964, in the same weekend that storms caused the Ruabon to Barmouth Line to suffer a similar washout. The last passenger train ran along the truncated route south of Strata Florida on 22 February 1965; inexplicably the BR network map dated 1965 showed Pencarreg, rather than Strata Florida, as the temporary northern terminus. The line remained open for freight using Hymek locomotives until around 1970, then by Class 37 locomotives. Despite closure to passengers, the branch lines also remained open for freight traffic. Withdrawal of freight facilities at individual stations started in December 1963. By 1965 freight-handling had ceased at all stations except Lampeter and Newcastle Emlyn, which then became railheads. Reconnection with Carmarthen railway station is currently impossible as the bridge that once carried the line over the River Towy was demolished in 1983.
were invited to take a short walk to admire the waterfall under the railway bridge. 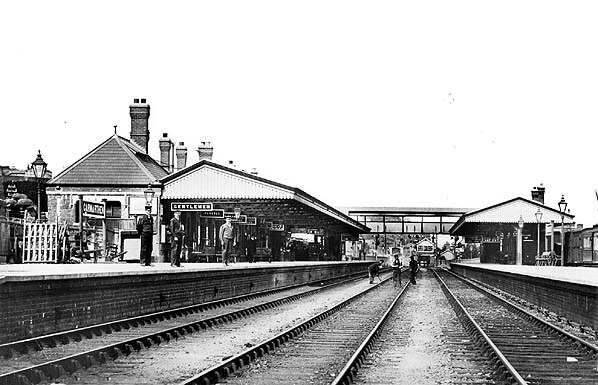 Carmarthen station looking north-east before September 1907. A passenger train stands in the bay on the right; this later became a through line. The signal box in the background is on the far side of the Pensarn Road bridge. 1906 1:2,500 OS map. A bay platform is seen at the north end of the station on the down side with another bay at the south end on the up side. This line was later extended to form a loop, with the up platform becoming an island. Carmarthen signal box is seen in the top right corner. Numerous sidings and a turntable are seen to the south of the station, a standard Churchward six-road engine shed with a large workshop, opened here on 11 February 1907 replacing an earlier depot at Carmarthen Junction. 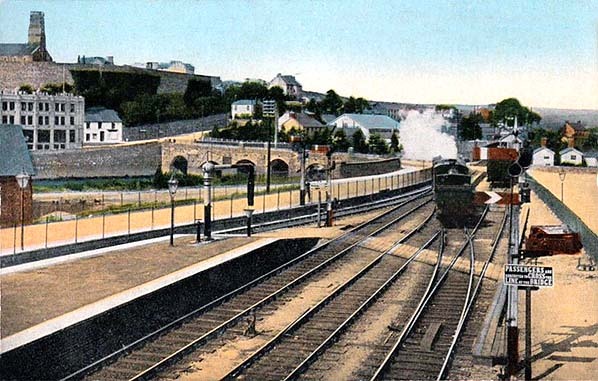 Looking north-east from Carmarthen station footbridge in 1911. Carmarthen station looking north-east from the south end of the up platform in 1936. The siding on the left was probably never used by passenger trains. 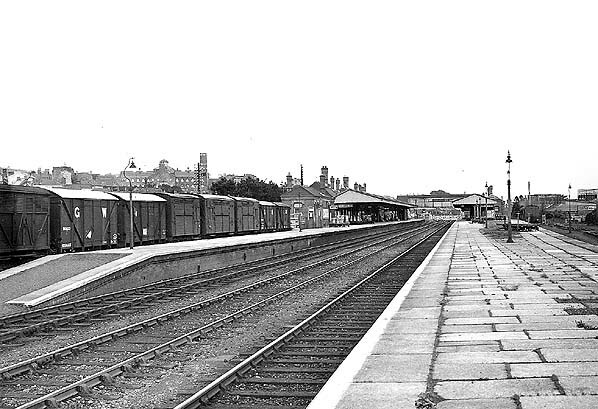 Carmarthen station looking south-west from the outer face of the island platform in the 1950s. 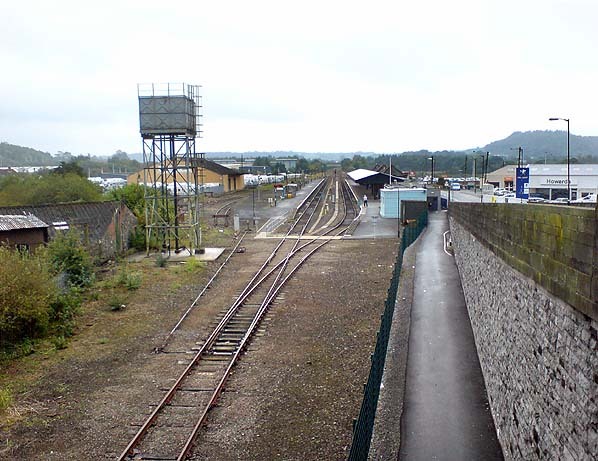 Carmarthen shed (87G) and workshops are seen on the left. 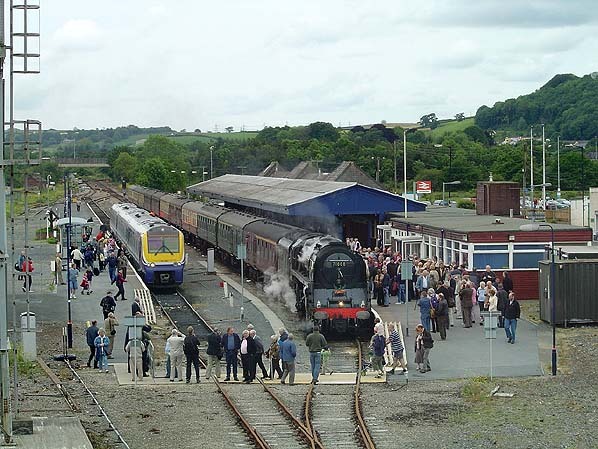 The shed was opened on 11 February 1907, replacing the earlier shed at Carmarthen Junction. 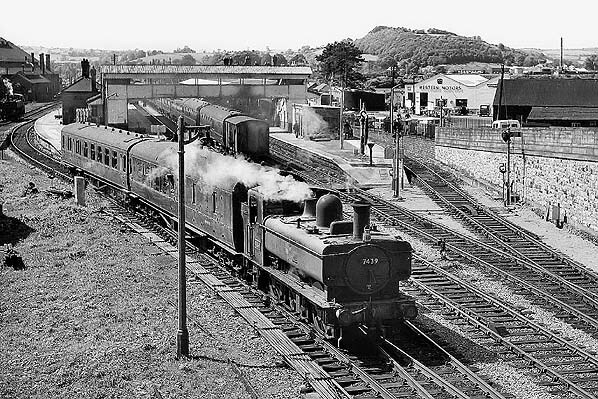 A stopping train from Swansea waits at Platform 2 at Carmarthen station in July 1958. This platform is now No. 1 as the bay platform is out of use. 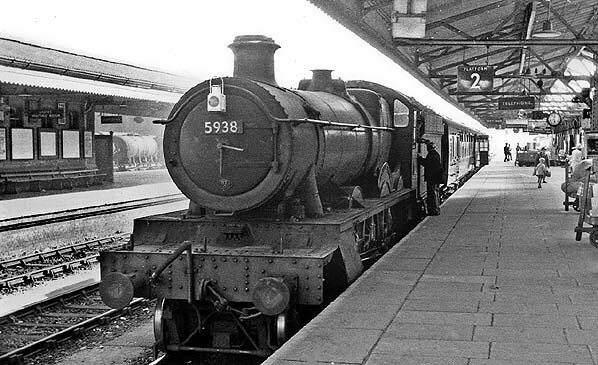 5938 entered service in July 1933 after being built at Swindon Works by the GWR. 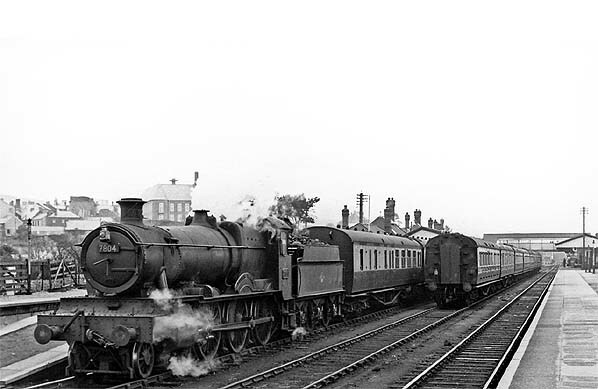 A Collett-designed Hall class named 'Stanley Hall', it passed to British Railways at nationalisation and was finally withdrawn in May 1963 and scrapped at Wolverhampton works in September of the same year. 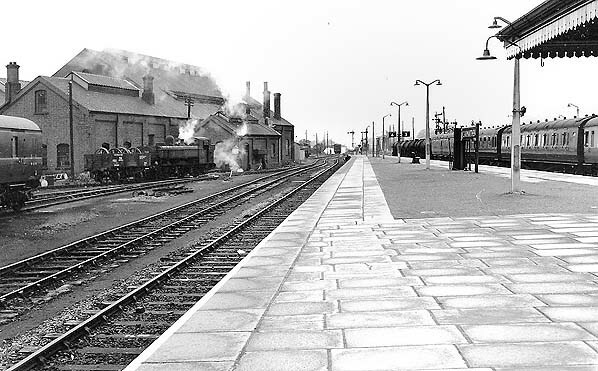 A stopping train for Milford Haven waits in Carmarthen station in July 1958. 7804 was built to a C.B. Collett design in February 1938 and was named 'Baydon Manor' after the early nineteenth century building of the same name in Ramsbury, Wiltshire. A product of GWR’s Swindon works, it had a service life of well over 27 years when it was withdrawn from 86E, Severn Tunnel Junction shed, in September 1965 and scrapped at Cashmores of Newport three months later. 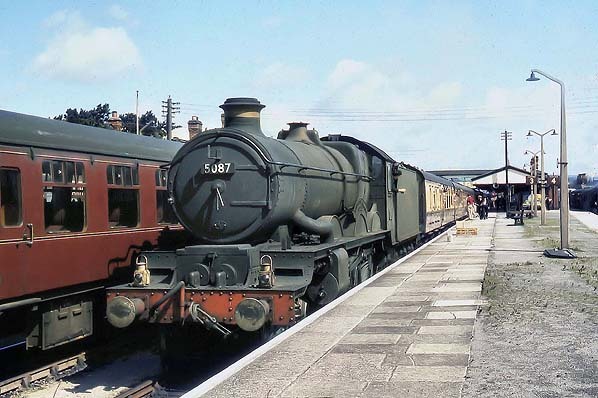 Castle Class 4-6-0 5087 'Tintern Abbey' at Carmarthen station with the up 'Capitals United Express' in August 1962. The bridge over the River Towy to the North of Carmarthen station in 1971. Carmarthen signal box can be seen in the distance. 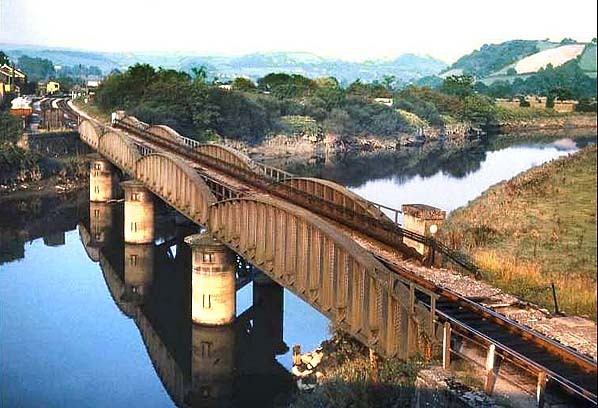 The bridge was demolished in 1983, which means that the Gwili Steam Railway can never rejoin the national network at Carmarthen. 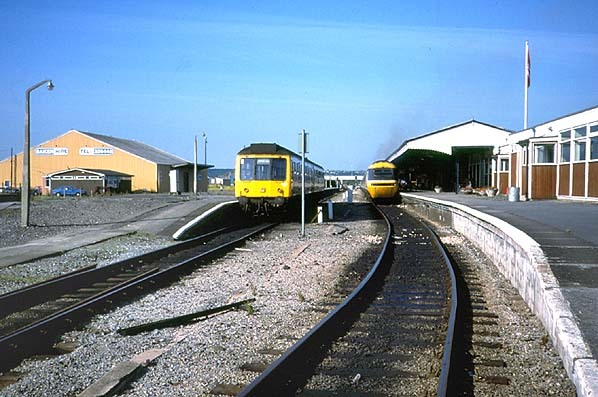 Carmarthen station looking south-west in July 1989; the station is now a terminus. An inter-city service waits in platform 1 with a local service in platform 2. The building on platform 2 has been demolished as has the footbridge. Passengers now have to use the old barrow crossing at the north end of the station from where this picture was taken. The huts on the right stand on the infilled bay line. The main station building on platform 1 still stands although the canopy has been replaced. The ‘Southern Irishman’ railtour at Carmarthen station. Departing Birmingham International at 06.05, 71000 came on at Newport departing at 08.54 for Fishguard Harbour. This tour reversed at Carmarthen and was diesel-hauled with the ‘Duke’ on the back to Fishguard, reversing again there for steam haulage back to Newport. 71000 itself was built to an R.A. Riddles design in May 1954. A prototype loco, it was withdrawn from Crewe North shed, where it spent nearly all its life, in November 1962. After seven years at Woodham Brother's scrap yard at Barry, South Wales it was bought for preservation in 1972 and was taken to Loughborough to begin a pioneering 16 year restoration programme. Looking south-west towards Carmarthen station in September 2011. The head-shunt is all that remains of the lines which came in to the north of the station from Newcastle Emlyn, Llandeilo. The site of the bridge over the River Towy in March 2012. looking south-west towards the first Carmarthen station (which is seen to the right of the building with the white roof). Compare this with the 1971 picture, above, which was taken from the opposite bank.